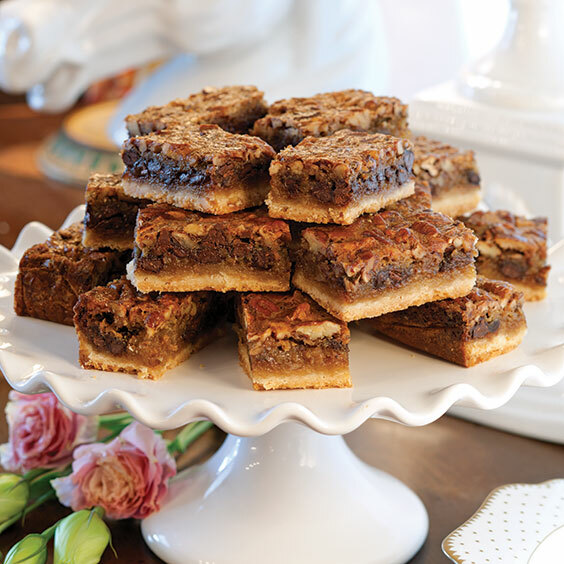 With the Kentucky Derby only a few weeks away, I thought I’d share this fun recipe for Derby Bars with you. These sweet squares, featured in Paula Deen’s Southern Desserts 2016, are full of chocolate, pecans, and a little bourbon. You’ll find similar desserts served all over Kentucky, especially in pie form. Whether you’re looking for cool, no-bake treats that are ready in minutes, juicy fruit cobblers, home-style pies, fluffy cakes, rich brownies, or something in between, Paula Deen’s Southern Desserts 2016 has you covered. From the most casual weeknight supper to Sunday dinners and birthday celebrations, you’ll find a dessert just right for any occasion. Preheat oven to 350°. Line a 13x9-inch baking pan with aluminum foil, letting excess extend over sides of pan; spray foil with nonstick cooking spray. In a large bowl, whisk together flour, granulated sugar, and salt. Using a pastry blender, cut in butter until mixture is crumbly. Press mixture firmly into bottom of prepared pan. Bake for 15 to 18 minutes or until lightly browned. In same large bowl, whisk together brown sugar and next 4 ingredients until combined. Stir in pecans and chocolate, and pour over prepared crust. Bake for 30 to 40 minutes or until center is set. Let cool completely. Using excess foil as handles, remove from pan before cutting into bars. Store in an airtight container for up to 5 days. The derby bars were great. Although had one problem the foil stuck to the bottom. I THINK I left them too lo g in the pan. These sounds terrific: one note, though. Traditional Derby Pie ( copyrighted by Kern’s Kitchens in Louisville) are always made with chopped walnuts, not pecans. I prefer pecans, but Derby purists would never serve bars or pies made with pecans for a Derby event! Audrey, Get a better class of person in your tearoom! Good for Audrey. Really John do you actually think that people who don’t drink alcohol are not “classy”? Shame on you. How about using bourbon extract? I sometimes use it in my poundcake! OMG Why did I have to see this while I am being sooo good on my diet:) YUM!!!!! My mom makes something simliar and they are out of this world! These sound delicious, but I can’t use alcohol at my tea room! What would you suggest in place of the bourbon? Hi Audrey! You can omit the bourbon and add a healthy dose of good quality vanilla. I’d add one tablespoon. The other tablespoon of liquid would not be missed. Thanks for this great southern recipe! I love Mississippi Mud- love chocolate, pecans, & melted marshmallows with chocolate icing!! 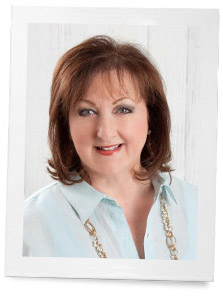 Your Derby Bars sound terrific, Phyllis! We are big Derby fans and this year we will be glued to the T.V. trying to catch a glimpse of our son who is celebrating his Bachelor party there before his May 21st wedding. He lives near Philadelphia, but he and 14 of his friends are driving/flying to Louisville to celebrate in a big way. As a former southern Indiana girl whose family all loved the Derby, watching it always brings back great memories! I subscribe to three of your magazines and love them all! Thank you for so many hours of great entertainment!!! Anything with pecans and chocolate will be a big hit in my family! Thank you for the recipe! OMG pecans AND chocolate. This would be a huge hit over here. Another great looking recipe thank you!